Just because GM has given up its long-held title of world's No. 1 automaker doesn't mean its fortunes have gotten worse. NEW YORK (CNNMoney.com) -- If the first quarter marked the end of General Motors' reign as king of the world's automakers, it was a good way for it to go out. Sales figures for the first three months of the year show Toyota Motor (Charts) had global sales of 2.35 million cars and light trucks, while GM (Charts, Fortune 500) had sales of 2.25 million. It marked the first time that GM had fallen behind a competitor in global sales since 1930. 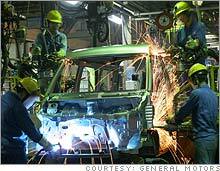 A GM car being built in China by its joint venture with a Chinese automaker. The U.S. automaker is seeing success in overseas sales even as it loses U.S. sales and its long-held No. 1 ranking. The irony is that GM's sales were actually pretty good in the quarter. Total sales rose 3 percent worldwide to the highest ever for GM. And most of the decline in U.S. sales were vehicles it's just as happy to be rid of - sales to rental car companies. Those sales aren't just less profitable (or even money-losing) for GM, they also drive down the value of other GM cars by flooding the market with low-mileage late-model used cars. GM's retail sales in the United States were essentially flat, edging up 0.5 to 677,274. But its fleet sales dropped by 57,000, or nearly 20 percent, leaving its overall North American sales down 6 percent in the quarter. "This was not an unexpected turn of events, but it happened a bit earlier than forecasted because of GM's decision to cut fleet sales," said Jesse Toprak, senior analyst for auto sales tracker Edmunds.com. "GM wasn't making much money on those cars anyway. All GM sacrificed in this decision was ego, since the executives knew Toyota would become number one sooner when much of GM's fleet sales were removed from the count." Cutting back or closing plants that GM was keeping open just to make unprofitable vehicles has been one of the keys to GM shaving its losses, so that its North American auto business nearly broke even by the end of last year. But the troubled, shrinking automaker that is still GM at home is a contrast to the growing, successful GM overseas. North America was the only region where it did not see a gain in sales in the period. And for the quarter, GM's overseas sales topped those in North America in total units, which was not the case a year ago. GM sales in Latin America, Africa and the Middle East jumped nearly 17 percent, and GM actually picked up market share in the region which quietly put up the biggest sales growth across the industry in the quarter. It also picked up ground in the high-profile, fast growing Asia-Pacific region, where China has the focus of just about every automaker's future expansion plans. And it posted gains in Europe as well. GM Chairman and CEO Rick Wagoner has said that hanging onto the No. 1 sales ranking isn't a priority, but that it's also a distinction GM won't give up without a fight. Monday GM spokesman John McDonald repeated those beliefs. "There's a focus on competition with all the global manufacturers, not just Toyota," he said. "There's room for more than one successful automaker in the world. The rivalry with our competitors is a good one. Ultimately the customer wins. But we're not going to let that rivalry distract us from what we need to do globally, and that is offer the best cars and trucks to our customers, no matter where they live." Toyota does not break down its sales on a regional basis, at least at this point. And a spokeswoman for the Japanese automaker also tried to downplay the idea of it grabbing the No. 1 automaker title as being important. "Ultimately our customers determine our success and rankings aren't important to our customers," Toyota Motor USA spokeswoman Sona Iliffe-Moon said. But Michelle Krebs, senior editor of Edmunds' AutoObserver.com, said that while Toyota is downplaying its passing of GM because of concerns about any backlash against it in the U.S. market, it has been aiming for the top spot for some time. "Toyota desperately wants to be number one," she said, adding that Toyota president Katsuaki Watanabe, who she said has been described as sharp, very aggressive and even a bit arrogant, was eager to achieve this goal despite his downplaying it in comments to the press. "The automaker just worries about what goes along with being number one," said Krebs. Still, it certainly appears that Toyota is unlikely to relinquish this new lead any time soon. Its 9 percent sales growth globally in the first three months of 2007 came about the right way. Not by chasing sales in order to keep factories running at capacity, but by adding new high-profit product to new markets. The quarter saw its first full-size pickup offering, the new Tundra, debut in the United States. The truck is built in a new plant in San Antonio. Toyota's fuel-efficient vehicles are well positioned if rising oil prices continues to push U.S. buyers from light trucks into cars. Its hybrid sales, while still a fraction of its total, give the company a great edge in the minds of those looking for environmentally friendly, fuel-efficient offerings, even if they end up buying a traditional non-hybrid vehicle. And Toyota and its Japanese rival Honda Motor (Charts) still have a real cost advantage over GM, Ford (Charts, Fortune 500) and DaimlerChrysler's (Charts) troubled Chrysler Group unit, which has been put up for sale after $1.5 billion in losses. That advantage can only help Toyota by enabling it to charge less for its vehicle and to plow more money back into product development. But the view of GM as a struggling, shrinking giant, which the loss of its long held No. 1 ranking suggests, isn't being mirrored overseas.